The machines may soon be taking over the reception desk. In July, the Henn-na Hotel will open in the city of Sasebo, Japan, and its owners hope this will be a new frontier for the hospitality industry. 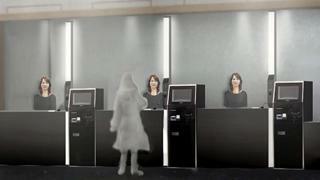 It will be staffed by 10 life-like robots, with only two flesh-and-blood staff members on the premises. The robots will greet guests, carry bags, and even clean rooms once a guest leaves. Complete with an eerily realistic female face, they are designed to speak several languages and respond to guest enquiries in the 72-room hotel. The aim is to create an all-round hi-tech experience, including facial recognition software to open doors. While not every receptionist or bellboy is under immediate threat from an imminent robot uprising, the wider hotel business is embracing new technologies. GTRIIP, a start-up founded in Singapore that has opened offices in the US, has developed a documentless check-in service using the iPhone's biometric features. Guests can securely check in at participating hotel chains using Apple's Touch ID fingerprint recognition technology to access the booking details saved on their device. At the hotel, receptionists have their own "kiosk app" for checking in guests. Co-founders Maxim Thaw Tint and Stanley Myo Lwin, both frequent travellers, were frustrated with time-consuming hotel processes and the need to carry multiple IDs or reservation documents. "When we researched the existing biometric technologies we found that the Apple Touch ID is out there since 2013 together with the iPhone 5S," says Mr Thaw Tint. "We decided to leverage on this because we don't want to reinvent the wheel." GTRIIP is of particular interest to business travellers, says Mr Thaw Tint, who will often choose the same hotel group, due to their loyalty program. "[This] is good for pre-verified Touch ID," he says. The start-up is already working with hotels in the US, Singapore, Sri Lanka, India, and Myanmar. US chain Starwood Hotels offers the SPG Keyless app, which lets guests use a smartphone or Apple watch as a door key. Customers can make reservations using the app, then on the morning of arrival they receive a notification with the details of their room. "That's your digital room key that allows you to go right to your room and use your mobile device to bypass check-in," says Starwood's Mark Vondrasek. Mobile brings a new level of convenience, he says. You're more likely to notice losing a smartphone than a key card. If someone does misplace their phone, the lock can be disengaged at reception. "With dual encryption both at password-at-the-phone level as well as at the lock level, we are convinced that Keyless is actually safer from a security standpoint than traditional keys are," Mr Vondrasek explains. "Our perspective on our guests' mobile device is that it really should be their remote control for their entire stay with us. Why can't they order more towels through their mobile device?" Eventually guests will be able to book dinner, order drinks, or make housekeeping requests through their smartphone without ever going near reception. "That's the work we're excited to build on in this space. We started with Keyless because it solved a critical point of check-in but we expect to be deep in mobile investment around a guest's stay over the next few years," he says. Hilton Worldwide has launched a digital check-in service for its HHonors rewards programme, where guests can choose their own room from a floor plan on the app. The company is also planning a smartphone key function in the near future. "Later this year, our guests will be able to use their smartphones to safely and securely unlock their hotel room door and other areas that require secured access, such as the gym or pool," says Geraldine Calpin, senior vice president and global head of digital at Hilton Worldwide. Other hotels have turned to social media, such as Instagram, to drive further guest engagement. The 1888 Hotel in Sydney has been called the Instagram Hotel, where popular members of the picture-sharing network can earn a free night's stay by sharing photos with the #1888Hotel hashtag. Conrad Hotels, a Hilton brand, uses Like2Buy - a shopping platform that lets Instagrammers view and book rooms through the app. The company says that in the first 30 days they saw several thousand click-throughs to their booking site, along with a spike in followers and brand engagement. But with new technology comes new threats. The Hard Rock Hotel & Casino in Las Vegas was targeted by malware in early May, with hackers stealing seven months' worth of credit card transaction data. In April, White Lodgings reported a data breach at several of its restaurants, including Marriot and Sheraton locations. This follows a separate data breach in 2013. In Symantec's Internet Security Threat Report, published in April, hospitality featured in the top 10 industries affected, both by incident and numbers breached. It has a history of being a soft target says Symantec principal security response manager, Joji Hamada. "Hotels also collect various personal data such as email addresses, billing addresses, phone numbers, and so on," he says. He believes the hospitality industry needs to take proactive steps to protect data, just like the retail industry. "There is interest for these types of personal information in the underground market, so data could potentially be sold."